El Valle de los Ranchos Water & Sanitation District was organized by the concerned residents of Talpa, Ranchos de Taos, Cordillera and Los Cordovas to address the needs of the community by providing safe drinking water and constructing a wastewater system. As these communities were growing rapidly, the need for safe drinking water and adequate disposal of wastewater became a top priority. In 1978, vecinos from these communities decided to form a water and sanitation district so that they could address these concerns. In 1979, the District was created according to the requirements of the State of New Mexico. A Water and Sanitation District is a sub-governmental entity of the State of New Mexico and has many of the same powers as a municipality. Among these powers are the power to incur indebtedness, the power to tax, the power to sue and be sued and the power of eminent domain. *Constructed 60,385 lineal feet of sewer main. *Constructed 9,159 lineal feet of sewer main. *Constructed 5,270 lineal feet of sewer main. *Constructed 11,898 lineal feet of sewer main. *Constructed 3,489 lineal feet of sewer main. *Constructed 10,181 lineal feet of sewer main. *Constructed 5,460 lineal feet of sewer main. *Constructed 315 lineal feet of sewer main. *Constructed 7,980 lineal feet of sewer main. *Constructed 403 lineal feet of sewer main. *Constructed 715 lineal feet of sewer main. *Constructed 26,774 lineal feet of water main. *Constructed 14,910 lineal feet of sewer main. *Constructed 700 lineal feet of sewer main. Total of 130,865 lineal feet (24.79 miles) of sewer main constructed between Summer 2004 and Fall 2016 (12 years) and connected 816 existing homes. Total of 26,774 lineal feet (5.07 miles) of water main constructed in Summer/Fall 2014. Phase 2C was completed during the Spring and Fall of 2016. This project is located east of the Ranchos de Taos Plaza commenced at Espinoza Road along Valerio Road to near the intersection of Valerio Road and Camino Abajo La Loma. The project also included the area below Valerio Road up to Gonzales Lane, and the area east of New Mexico Highway 68 between Camino Abajo de La Loma up to near New Mexico Highway 518, and east to La Morada Road. This project provided 14,211 feet of sewer main with manholes and service lines to approximately 100 homes. Construction funding was provided by NMED from the Clean Water Revolving State Loan Fund (CWRSF). In order to qualify for the NMED CWRSF El Valle needed to update the Preliminary Engineering Report and the Environmental Document so that the project can be let to bid. Phase 2D-1A was completed in the Winter of 2016. This project was a continuation of the 2C project, beginning near Gonzales Lane upstream to include the area between Camino Abajo de la Loma to near Highway 518. This project provided 700 feet of sewer main with manholes and service lines to approximately ten residences. During the Spring of 2015, Phase 2C-3/5 was constructed. The District was awarded $80,000.00 in Capital Outlay funding at the 2014 NM State Legislature to fund the construction of an extension of the sewer trunk line within Phase 2C-3/5. This Phase extended from the south entrance of Ranchos Post Office north for approximately 700 feet. This wastewater sewer line project commended at the south entrance to the Ranchos Post Office at an existing manhole located in the northbound lane of NM Highway 68 and runs uphill along NM Highway 68 to near the south entrance of the Italian Restaurant for a total distance of approximately 1,600 lineal feet. This phase of sewer line extension provides sewer service to approximately eight residences and several businesses. Partial funding for this sewer main extension provided by the 2014 NM State Legislature in the form of a Capital Outlay award of $80,000.00. In addition, there was a cost-share that provided $20,000 and El Valle is providing approximately $94,000.00 for a total project budget of $194,000.00. During the Spring and Summer of 2013, construction of Phases 2B-2 and 2B-3 waste water improvements was completed. It allowed several residences and businesses in the greenbelt and the densely populated St. Francis Plaza area to connect to the District’s sanitary sewer line. These were funded through a grant/loan of $860,000 at a 50% grant/loan ratio from the New Mexico Environment Department. Phase 2B-2 extended the existing sewer line from Abeyta Road (off of State Road 240) all the way to NM Highway 68. Phase 2B-3 then extended the sewer line from NM Highway 68 to the Saint Francis Plaza and up to the south entrance of the Ranchos Post Office. Also, during the Summer of 2013 Phase 2C-1 and Phase 2C-4 were completed. Phase 2C-1 runs along Valerio Road East of the Old Santa Fe Highway on to Espinoza Road. Phase 2C-4 runs from the intersection of Espinoza Road and Valerio Road, going North on Espinoza Road toward East Camino Abajo de la Loma. In the Summer and Fall of 2014, Phase 3A Water was constructed, 5 miles of water from Llano Camino Sur to West Romero Road to Cuchilla Road to Highway 382. El Valle was awarded a Grant/Loan from the New Mexico Water Trust Board in the amount of $1.1 million at a 90% Grant /10% Loan ratio for the Phase 3A Water Project. This Phase was completed during the Summer and Fall for 2014. This first phase of the District’s water distribution system is a joint effort between the District and the Llano Quemado Mutual Domestic Water Consumers’ Association. This five mile stretch of water line is providing water to the west side of Llano Quemado in the Cuchilla and West Romero Road area. Property owners who connect to the District’s water system will still be allowed to continue using their private well for outdoor use. Not only does this project provide clean drinking water to those residents who wish to connect to the District line, but it provides sufficient water for fire protection. It is not mandatory to connect to the District’s water system and property owners who connect to the District’s water system will still be allowed to continue using their private well for outdoor use. Also in 2008, the District extended its sewer service from the Town’s sewer trunk line that lies just south of State Road 240 (Ranchitos Road) and extends through private property to Tom Holder Road. This line was completed during the fall of 2008, allowing approximately 20 residences to connect to the sewer. This line will be extended as project 2B through the ‘Rio Grande del Rancho Greenbelt’ all the way east to State Road 68 and into Ranchos de Taos. The engineering design has been completed and all necessary easements have been obtained. Full construction of the line depends upon state or federal funding. 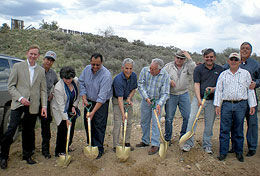 During 2008, the District also completed Phase 1E which extended sewer service to the Morada Road area of Talpa. Many new residences were able to connect to this line since completion in the fall of 2008. Abeyta Engineering, Inc. was awarded a 4-year contract in 2008 to continue to assist the District in its design of future wastewater collection lines and water distribution lines. It recently completed the design of Sewer Phase 2C which will extend service from Ranchos de Taos into Talpa, just south of State Road 518. In 2009, Phase 1F was completed. This extension provides sewer service on the west side of State Road 68 off Sisneros Lane. It also provides service to residences near Paul’s Bar just north of State Road 518 and east of State Road 68. Phase 1F extended sewer service south of Morada Road across Tros Road to Archuleta Road, in the Talpa area. This area contains many high density residential pockets where sewer service is desperately needed. Phase 1F will serve approximately 60 additional residences, of which many have already hooked up. Also in 2009, El Valle de los Ranchos entered into a joint powers agreement with Llano Quemado Mutual Domestic Water Consumers’ Association. This agreement allows the two entities to cooperate in constructing an extension to Llano Quemado Mutual Domestic’s water system in Llano Quemado. The parties were notified that they would receive a $100,000 award from the New Mexico Water Trust Board for design and planning of the water distribution system. The designing and planning will take place during 2010. The parties have applied to the Water Trust Board for additional funds to construct the system. During the fall of 2009 and the spring of 2010 the District completed construction of Phase 2B-1 which brought the sewer from Tom Holder Road, east to Abeyta Road. The District is awaiting additional funding in order to complete Phase 2B which will extend service to the Ranchos Plaza. In December 2010the District completed the construction of its new office building to house its growing operation. The construction of the office building was funded by a loan/grant from the United Stated Department of Agriculture. The office is located at #8 Miranda Canyon Road in Llano Quemado just south of the Llano Quemado Community Center. 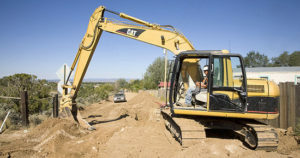 Beginning in 2007, the District began a cooperative project with the University of New Mexico, Taos Branch to assist UNM’s Klauer Campus, located near the Taos Country Club, to connect to the sewer. This collaborative effort required the participation of UNM-Taos, El Valle de los Ranchos Water and Sanitation District, the Town of Taos, and the United States Department of Agriculture, Rural Development Division. The District received a loan and grant package from USDA-RD in the amount of $1.4 million, of which $864,000 was a low interest loan and the rest grant funding. The loan portion of the package was paid back by UNM after the project was completed. The remaining funding will be used for the sewer line and other District purposes. The sewer line is now complete, allowing UNM-Taos to fully utilize the Klauer Campus for classes starting in the Fall semester of 2008. During 2002 El Valle representatives met with then Governor Gary Johnson and informed him of the communities’ need for a sanitary sewer system and he gave his full support and endorsement to the project. El Valle than approached the Legislature and requested funding for the project. The Legislature responded with a $440,000 grant, which was used for engineering services, surveying properties, property appraisals, and purchasing right-of-ways on the properties in order to construct the sewer system. Phase 1A and 1B were completed in 2005. The construction created approximately 10 miles of sewer and allowed over 300 residents to connect to the sewer. In 2006, the District received a $1.6 million grant from the New Mexico Legislature, to be administered by the New Mexico Environmental Department. The purpose of this grant was to continue construction of Phases 1 and 2 of the sewer masterplan. Also in 2006, the District began construction of Phases 1C and 1D, which extended the sewer line east on the south side of Este Es Road to Maestas Road. Phases 1C and 1D were completed in 2007, allowing an additional 50 to 60 residents to connect to the sewer. Water testing has been done yearly since 1997 and results of those tests have over the years shown increasing contamination of the water. 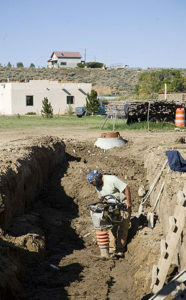 In 1999, El Valle was authorized by the Taos County Commission, as permitted by New Mexico law, to impose a mil levy tax on the property owners within the District in order to generate a source of revenue to procure engineering and other professional services to begin the building of a sanitary sewer system for the community. In March 2000, El Valle received a grant of $50,000 to assist with the development and implementation of water, wastewater and solid waste projects. With mil levy tax monies the District hired Abeyta Engineering, Inc. to develop a wastewater and water master plan. Abeyta Engineering went to work immediately on the sanitary sewer needs of the District and completed a Wastewater Sewer Masterplan in 2000. The extensive plan contemplated over 40 miles of sanitary sewer collection lines to be constructed over a period of many years. The Masterplan identified the need to construct these lines in seven phases. Abeyta Engineering then retained the services of Taschek Environmental to research the environmental needs of the area and to create the necessary environmental, archeological and biological reports. During this period the District’s Board of Directors identified Phase I as a priority area for construction. The Phase I area is on both sides of SR-68 from Chamisa Road, south to the junction of SR-518, then north and east to SR-518 to the forest service boundary, and east to Maestas Road at the highest point in the aquifer which supplies the private wells of our citizens. Abeyta Engineering was then told to finalize the design for Phase I creating a total gravity-flow system in the described area.